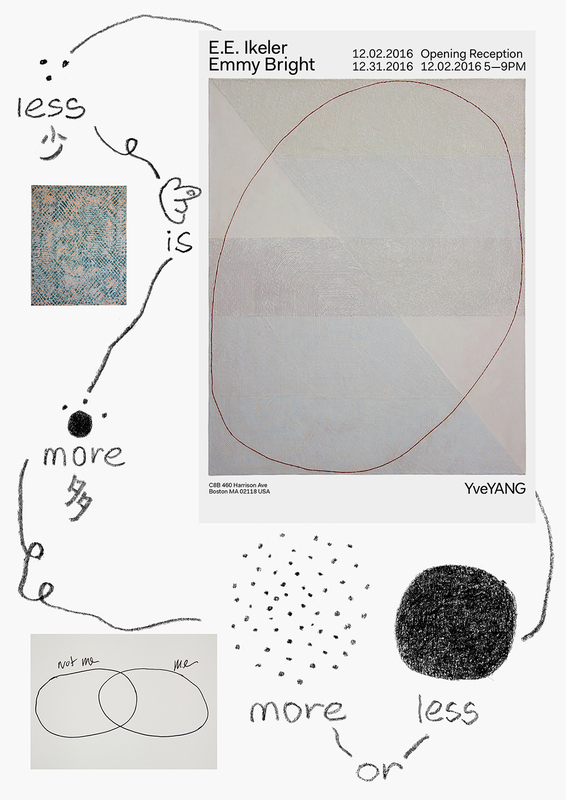 YveYANG Gallery is pleased to present a joint exhibition Less is More More or Less, featuring recent works from the artists Emmy Bright and E.E. Ikeler. This exhibition will run from December 2 through December 31, 2016. The opening reception will be on Friday, December 2, 2016 at YveYANG Gallery from 5:00 p.m. to 9:00 p.m. Less is More More or Less brings together Emmy Bright and E.E. Ikeler, two artists who use text as the basis for their work. In everyday life, the shortcomings of language are outweighed by the desire and need to communicate. Yet both Bright and Ikeler privilege the instability and failures of language over its normative functionality in their work. So what opportunities does this failure make possible? In this exhibition, the descriptive capacity of words gives way to abstractions, contradictions, and visual surplus. Bright’s prints use diagrammatic forms to chart the ephemeral: feeling, relationships, self, and other. While the images they create seem to speak in the language of logic, the clarity of this logic is fraught with absurdity, humor, and incongruity. The desire to understand notwithstanding, Bright’s work questions the usefulness of words to do so. In Ikeler’s paintings, four-letter words are imbedded in grids and color fields. Their legibility comes second to the paintings visuality; as though the text is disappearing as it comes into focus. The paintings are made by the application and subtraction of many layers, so they often seem inscrutable as objects; like the text, at first the artist’s labor seems illegible. But tell-tale textural, color, and surface differences reveal themselves over time, asking viewers to look closer. For both artists, what the works “say” and what they “mean” cannot be assumed to be the same thing. Emmy Bright (b. 1977) works with drawing, print, and performance all inspired by ongoing research into psychology, comedy, pedagogy and art history. E.E. Ikeler (b. 1986) received a BFA from The Cooper Union in 2008 and an MFA from Yale University in 2016. She’s had recent solo exhibitions at Jeff Bailey Gallery in Hudson, NY, and at the project space In Limbo, in Brooklyn, NY.